On 7 May 2009, U.S. Postal Service honored America's favorite cartoon family, the Simpsons on a series of postage stamps. 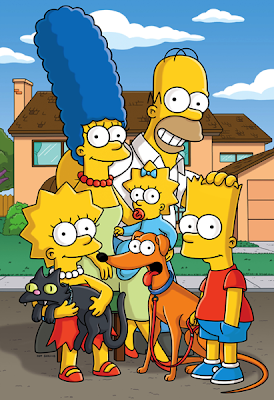 The Simpsons, currently in its 20th year as a regularly scheduled half-hour series, is the longest-running comedy in television history. The show is a cultural phenomenon, recognizable throughout the world. Each of the five stamps is devoted to a Simpson: Homer, Marge, Bart, Lisa and Maggie. The new stamps is a continuation of the pop culture trend in the Postal Service's stamp program that started with the massively popular Elvis issue in 1993. Over the years subjects such as the Muppets, Disney characters, comic book heroes like Superman and Spider-Man, and most recently Star Wars have appeared on commemorative stamps. 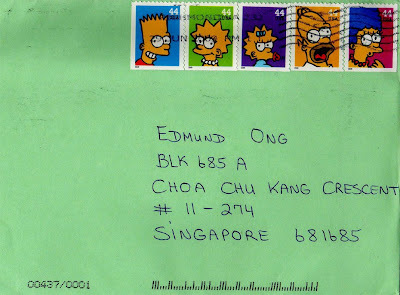 I would like to thanks Chrissy Boudaouch for sending this lovely cover franked with a complete set of Simpsons stamps! This cover was postmarked on 29 June 2009 in Richmond, Virginia, U.S.A. and took 5 days to travel an estimated distance of 15,703kms.